Number 21 in the series: Campaign for the Removal of English Errors in Public. 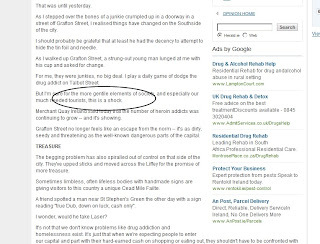 It's been a while since we had anything from the press, but here is one via an anonymous source, as they say in the business, from last Friday's Evening Herald. 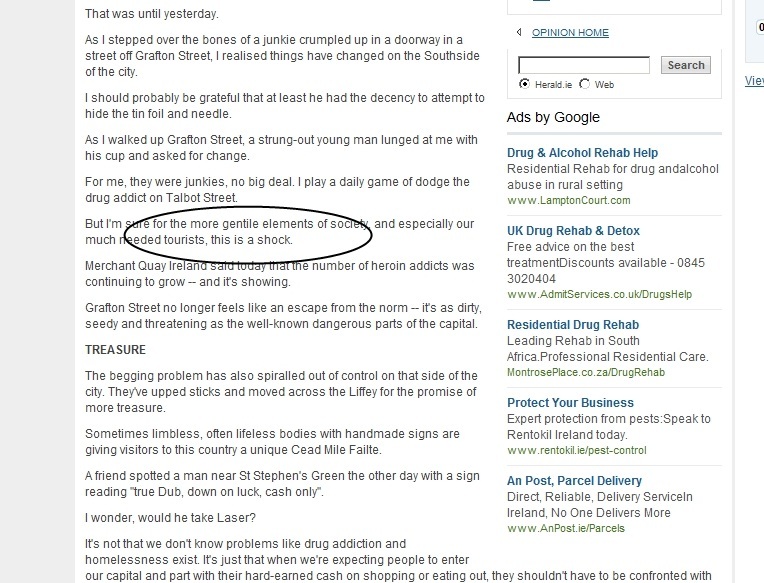 The article is : 'How the drug zombies have swamped even Grafton Street' (brilliant - drugs! zombies! swamping!). Half-way down there's a curious image (click on the picture above for a closer look):- As I walked up Grafton Street, a strung-out young man lunged at me with his cup and asked for change. For me, they were junkies, no big deal. I play a daily game of dodge the drug addict on Talbot Street. But I'm sure for the more gentile elements of society, and especially our much needed tourists, this is a shock. Odd to get a Jewish angle on swamping drug zombies.